Imaging for Windows® is document imaging and scanning software for Microsoft Windows. Imaging for Windows has an optional ActiveX toolkit to develop image-enabled applications. The ImgEdit, ImgAdmin, ImgThumb, ImgScan, ImgOCR and ImgPdf OCX (ActiveX) controls allow you to add Imaging for Windows functionality to your software. Imaging for Windows Developer Resources Kit unlocks the ActiveX controls. For Microsoft Windows users seeking Kodak Imaging for Windows capabilities and for developers who have used the ActiveX (OCX) controls to integrate imaging functionality within applications, Global360 Imaging for Windows provides the Imaging features found in Microsoft Windows 95 through to Windows 2000 but no longer included in Windows XP, Windows Vista or Windows 7, 8 or 10. The ActiveX controls ImgEdit, ImgAdmin, ImgThumb, ImgScan and ImgOCR are included. Release 4.0 adds an ImgPdf control. A Software Development Kit is available to enable the ActiveX controls. The SDK is known as the Imaging for Windows 4.0 Developer Resources Kit. Imaging for Windows Developer Resources is a separately packaged and licensed offering that enables organisations to leverage powerful, highly-developed ActiveX controls to create robust custom applications with integrated imaging capabilities. The Imaging for Windows ActiveX controls enable software developers to add imaging capabilities to custom applications and programs that support ActiveX, including for Visual Basic (VB6) and Visual C++ programming. The "Imaging for Windows 4.0 Developer Resources Kit" can either enable the ActiveX controls supplied with the "Imaging for Windows 4.0" end-user application, or can enable the ActiveX controls only product "Imaging for Windows 4.0 Developer Resources licence pack". In either case, one licence per PC is required. Image Edit Control (imgedit. ocx) – Displays, annotates, manipulates, and manages image files. Image PDF Control (imgpdf.ocx) – A new Imaging for Windows 4.0 control adds PDF display and print functions to applications. Intel Pentium or equivalent processor. Windows 10, Windows 8, Windows 7, Windows Vista™ with Service Pack 1 (or later), or Windows XP with Service Pack 2 (or later). 64 MB RAM or more for Windows 2000 and Windows XP, or 1 GB RAM or more for Windows Vista or later. At least 35 MB of available hard disk space on the system drive. VGA controller with at least 1 MB of memory. TWAIN-compliant scanner or other device (optional) and fax/modem card (optional) to take advantage of Global 360 Imaging for Windows scanning and faxing capabilities. A programming language or application capable of supporting ActiveX or OCX. VB6 (Visual Basic) and Excel are suitable. Windows 2000, Windows NT and Windows 98 include a free, non-distributable, version of Imaging for Windows without the OCR(Optical Character Recognition) and other advanced features of Global 360 Imaging for Windows. Windows XP and later does not include a free version of Imaging for Windows, and free versions from older operating systems may not be installed upon it. 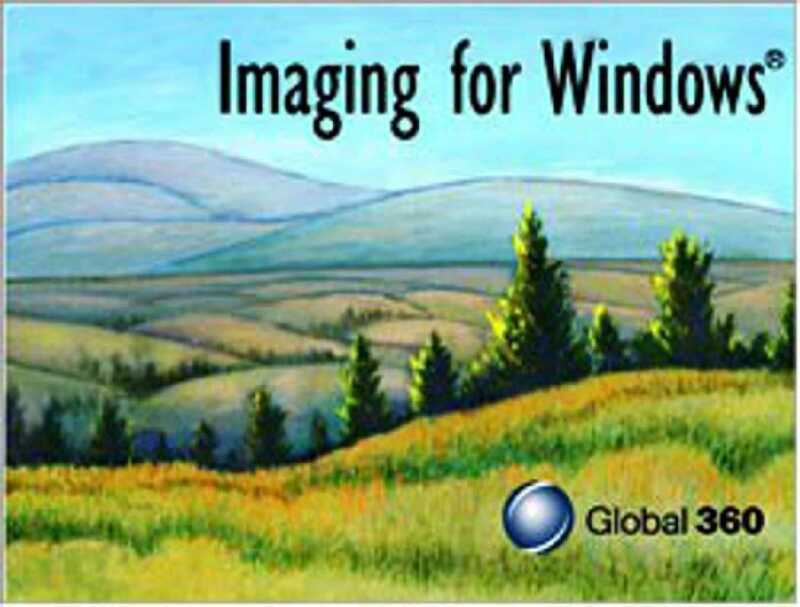 Global 360 Imaging for Windows requires one licence for each PC it is installed on. Volume licence packs are available. For Windows XP, Vista and Windows 7, 8 and 10, a Software Development Kit ("Developer Resources Kit") is required. SDKs are available for in-house application development or for developing applications for resale. The ActiveX controls in Imaging for Windows 4.0 are not enabled until you obtain a Developer Resources Kit. The end-user Imaging for Windows 4.0 application includes the ActiveXs, but they are not enabled until you have a Developer Resources Kit license. IMAGING4.0-DEV Developer Resources Kit enables the ActiveXs included with the end-user Imaging for Windows application, allowing software development. You must have one end-user Imaging for Windows 4.0 license (IMAGING4.0-LP-x) for each PC. Note the IMAGING4.0-DEV Developer Resources Kit is for development purposes only and may not be used in live systems. The Imaging for Windows 4.0 ActiveXs are available without the end-user application. A Developer Resources Kit license is also required. IMAGING4.0-DEV Developer Resources Kit enables the use of the Imaging for Windows 4.0 ActiveX licences purchased as a License Pack (IMAGING4.0-DEV-LP-VOL, see below, minimum order quantity 30 licenses per order). Note the IMAGING4.0-DEV Developer Resources Kit is for development purposes only and may not be used in live systems. IMAGING4.0-DEV-LP-VOL is the individual license pack, providing the right to use the ActiveX controls (but not the end-user Imaging for Windows 4.0 application). One license is required per PC, minimum order quantity 30 licences. Each OCX control has a LicenseCheck method. You need only use the method once in an application (not for each OCX). Typically this will be near the start of the application. ImgAdmin.LicenseCheck(LicensePath) where 'LicensePath' is the full filepath and name of the developer licence file. The developer licence is the file with a .lic extension eg "Imaging_12345678-a123-b123-c123-d123-1234a567b8c9.lic"
One license is required to enable ActiveX controls. you also require Imaging for Windows 4 user licenses (1 per PC). The Imaging Developer Resources license enables use of the ActiveXs in all your Imaging for Windows user licenses. After unzipping this file locally, refer to the extracted readme.txt file for install instructions. Imaging for Windows 4.0 Hotfix (for Developers Kit only). We recommend you download the Imaging for Windows Hotfix for Developers Kit for release 4.0 of Imaging for Windows. This hotfix should be applied to release 4.0 only. Do not use on older releases.